The Healthiest Cultures in the World, Eat Seaweed Everyday. Everyone wants to be healthy and most people know that that in addition to living a healthy lifestyle and getting regular exercise, the key to maintaining optimal health is getting proper nutrition through a healthy diet and a sensible supplementation protocol. The healthiest cultures in the world, eat seaweed on a daily basis. This practice is very prevalent in the eastern cultures, but not so much in the western world. The health of westerners often pales in comparison to that of their eastern culture counterparts, who consume seaweed and take whole food supplements daily. Seaweed comprises a diverse group of organisms (known as macroalgae), that grow in the sea. 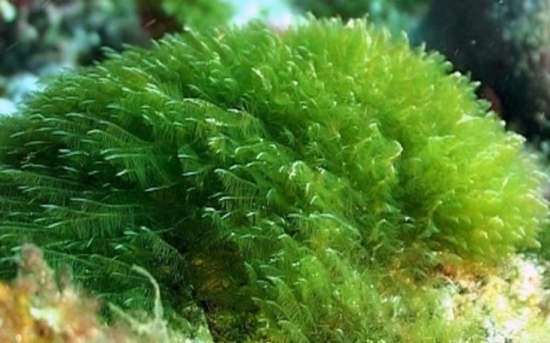 These sea plants appear similar to land plants, however they lack the complex reproductive structure (flowers) and functional tissues (roots, stems and leaves) that land plants have. Brown seaweed (also known as Kelp) contains approximately 1,500 species, and comprises the largest and most complex body structure of any other algae. Most species are marine and benthic (attach to the ocean floor or other hard surface). The stem-like stipe on each side is lined with large leaf-like structures (blades); the stipe and blades are collectively known as the frond. Gas-filled bladders cause the upper end of the stipe to float on the ocean surface. Kelp grows in underwater "forests" (kelp forests) in shallow oceans, and is thought to have appeared in the Miocene, 23 to 5 million years ago. 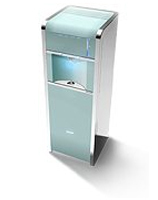 The organisms require nutrient-rich water with temperatures between 6 and 14°C (43 and 57 °F). They are known for their high growth rate, with some varieties growing as much as a half a meter a day, ultimately reaching 30 to 80 meters (100 to 260 ft). Kelp is a rich source of both fucoidan and organically bound iodine. Green seaweed comprises over 7,000 species. While most are marine, many can be found in fresh water, along both rocky and sandy beaches. Some green seaweeds tolerate low-salinity colonizing areas where rivers meet the sea. Green algae range from the single-celled to moderately complex structures. Red Seaweed Consists of more than 4,000 species and grow in marine environments. Not as large as brown algae, the red seaweed body (thallus) is built of complex, branched filaments. Red are benthic, but their distinctive combination of photosynthetic pigments allows them to survive in deeper water. 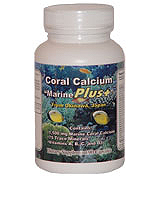 Some species secrete calcium carbonate, which significantly contributes to coral reefs. Seaweed has been used since 2700 BC in China. In 600 BC, Sze Teu wrote that in China seaweed was made for special guests or kings. In 300 BC, Chi Han wrote a book about seaweed. Kelp was used in the 5th century for food, and Laminara japonica was imported from Japan in the 5th century. The Japanese have used seaweed for many years. For over 2000 years, seaweed has been used as a supportive food in the Japanese diet. Six types of seaweeds were used in 800 A.D. in everyday cooking in Japan. In 794, Japanese people used seaweed to make nori, which is a dried sheet of seaweed. Europeans used Mediterranean seaweed as an herbal medicine. As early as 100 BC, the Greeks collected seaweed. All along the Mediterranean coast, red algae were used as sources of dying agents and as a medicine to treat parasitic worms since pre-Christian times. Hawaiians and other Polynesian societies grew kelp farms. They used 60-70 species of seaweed for food, medicinal purposes, and ceremonies. One of the Earth's greatest treasures lies beneath the seas and lakes of the world. Research has proven that the waters of our oceans contain some of the richest known sources of mineral elements. The moving forces of nature, through rain, erosion and rivers, has brought all the valuable vitamins of the earth to the sea floor. These vast sources of nutrition may become much more important than any of us now realize. Land degradation, pollution and over farming has had a drastic affect on the soil. Most commonly, it is from the soil that we derive our minerals and vitamins from the fruits and vegetables we eat. If this food grown on land can no longer give us all the nutrients we require, we must turn to the rich vegetation of the sea, seaweed. Sea Vegetation, the keystone of the food chain, offers us the nutrients we can no longer gain from land grown crops. Not all Sea Vegetable Sources are Equal. There are other sea vegetable supplement products on the market, some which boast of how many different species of seaweed they contain. While there is something to be said for consuming a diverse selection of seaweed species . . . Much more important than HOW MANY species a product contains, is WHERE the species come from. In today's post Fukushima world, WHERE the raw materials are sourced from could not be more important! What good is having a diverse selection of species, if they are tainted with radiation or other contaminants? It's true that compared to land plants, we have little control over the growing conditions of our wild marine plants. But we do have choices about how, when, where, and how much we harvest, as well as how the seaweed are transported, dried, stored and packaged. Sea of Greens® contains seaweed harvested from the pristine waters of the Northern Atlantic Ocean. Sea of Greens®is untainted by radiation, heavy metals, herbicides, pesticides, and microbiological contaminants. Sea of Greens® contains fresh harvested sea vegetables, which are low-temperature dried and hand packed with minimal processing. an optimal blend of seaweed and freshwater algae. Sea of Greens® is more potent and nutritionally dense than any land plant food source and contains hundreds of organic phytonutrients, many of which our bodies require to maintain optimal health, but are missing from our normal diets. Sea of Greens® contains a full spectrum of organic vitamins, trace minerals, lipids, plant sterols, amino acids, omega 3's and 6's, anti-oxidants, growth hormones, polyphenols, flavenoids, and much more. 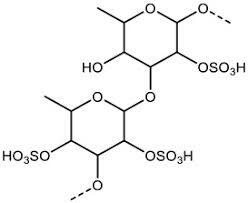 It also contains powerful Fucoidan, Laminarin and Alginate compounds, which are not found in land plants. Wakame has long been known to be a delicious, healthy food. In Korea, it is given to mothers after they give birth to replenish the nutrients lost during the gestation and delivery. In Japan, the people of Okinawa have the highest per capita consumption of seaweed, the lowest rates of cancer, and a higher life expectancy of all Japanese prefectures. And Japan itself has the some of the highest life expectancy amongst all countries. There are over 100 medical studies that link seaweed, and Wakame in particular, to better health - and all this without any synthetic or toxic chemicals. Wakame has traditionally been cultivated by growing it on ropes tied to offshore rafts. It's mainly the seaweed "leaves" or blades that are harvested. However, all parts of the plant, except the root, are used. These can be eaten raw or cooked and can be added to soups and salads to give them that extra "umami" or savory taste. Yet it's only about 13 calories per 30 g of raw seaweed. That tiny calorie content in Wakame is due to its low levels of fat and carbohydrates. It's also rich in vitamins and minerals. The USDA National Nutrient Database gives a complete nutritional profile of Wakame; the list of nutritional benefits includes vitamin A, vitamin C, vitamin E, vitamin K, niacin, pantothenic acid, phosphorus, riboflavin, folate, calcium, iron, magnesium, manganese and copper. One note of caution is that Wakame also contains a high amount of sodium. It is important to soak the wakame thoroughly to reduce the amount of salt used to preserve it during storage and transportation. Involved in the production & transport of energy and the production of protein. 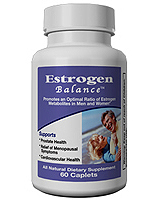 maintains the balance of the thyroid gland and is needed for the production of thyroid hormones. Most people (as many as 80%) in the developed world suffer from mild iodine deficiency. This deficiency is often undiagnosed and leads to a variety of systemic diseases. Iodine deficiency gives rise to hypothyroidism, symptoms of which are extreme fatigue, goiter, mental slowing, depression, weight gain, and low basal body temperatures. 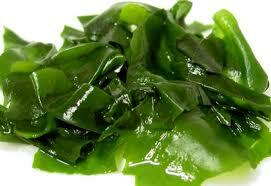 Wakame is a very bioavaiable source for of calcium. Each 100 grams of raw wakame contains 150 milligrams of calcium, which is needed for strong healthy bones. Vitamins A, C, E, and K. These vitamins are all amazing for skin health and repair as well as immunology. 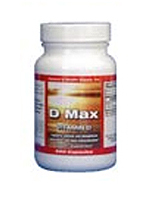 Vitamin D. Promotes the absorption of calcium for healthy bones and enhances the nerve, muscle, and immune systems. Riboflavin (Vitamin B2). We need riboflavin to use the carbohydrates, fats, and proteins in the foods we eat. Riboflavin helps us use these nutrients for energy in our bodies for growth and is also necessary for red blood cell production. Riboflavin functions as an antioxidant and works in the body with other vitamins such as niacin, folate, and vitamin B6. Folate (Vitamin B9). 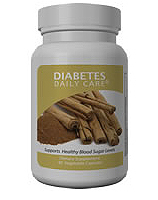 Helps the body make new cells and is especially important for pregnant women. Wakame contains 200 mcg in a 100mg serving - which is 50% of our daily requirements. Lignans, a phytonutirent rich in antioxidants and thought to help regulate hormone levels and support the immune system. 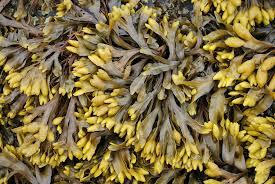 Rockweed (Ascophyllum nodosum) is common large brown seaweed, dominant on sheltered rocky shores. The species has long strap like fronds with large egg-shaped air bladders at regular intervals. The fronds of Ascophyllum nodosum are typically between 0.5 and 2m in length. The inflated bulbs at the end of the blades along with a midrib in the blade are major distinguishing characteristics of rockweed. The bulbs are filled with air and mucilage that allows the blades to float exposing them to sunlight and allowing water to move through the branches. The bumps on the bulbs are reproductive structures called pits or conceptacles. Special cells within the pits produce eggs and sperm which are released into the water column and fuse producing a baby plant. The new plant then grows directly into an adult. Reproduction occurs through the year. Other seaweeds have a more complicated reproduction cycle where one form produces eggs and sperm while another form produces spores. The plants drift in large, spherical masses in sheltered waters, grow slowly and can live to be several decades old. Individual fronds can become up to 15 years old before breakage. Sea lettuce (Ulva lactuca) is a bright green algae composed of lobed, ruffle-edged leaves with a broad translucent frond that is just 2 cell layers thick. It has a rather "crumpled" appearance and is reminiscent of a lettuce leaf, hence the common name. Its leaves are often perforated with holes of various sizes. Almost no stalk exists at the point of attachment, and no true roots are present. Despite looking flimsy sea lettuce is quite strong for leaves only two cells thick and can easily be harvested, in or out of the water. Sea lettuce is the greenest seaweed you will ever see. When dried by the sun, its color can range from white to black. The sea lettuces are widely distributed along the cool water coasts of the world's oceans and are eaten by a number of different sea animals, including manatees and the sea slugs. Sea lettuce may be found attached to rocks and shells by a holdfast, but it is also commonly found free floating. Among the most common of the shallow water seaweeds, sea lettuce is often found in areas of exposed rocks and in stagnant tide pools. Sea lettuce has also been recorded at depths of 75 feet or more. Sea lettuce grows in both high and low intertidal zones and marshes throughout the year. There are ten species of sea lettuce, all of which are edible and and a good food source for humans. Sea lettuce is high in protein, soluble dietary fiber, and a variety of vitamins and minerals, especially iron and calcium. It is usually eaten raw in salads and cooked in soups. It can also be used as a substitute for nori, a seaweed used in sushi. Nutritionally Sea lettuce is very high in iron and protein (similar to dulse), and is high in iodine, aluminum, manganese and nickel as well. 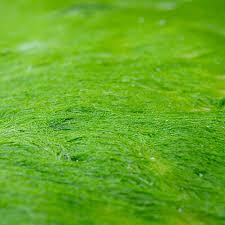 Like most of our sea veggies, sea lettuce provides considerable amounts of dietary fiber (31%). Since our sea veggies are low temp dried in the sun, sea lettuce enzymes are still active. Dulse (Palmaria palmata) is a red alga (Rhodophyta), which trypically grows on the northern coasts of the Atlantic and Pacific oceans. Dulse grows attached by its discoid, holdfast to the stipes of Laminaria or to rocks. It has a short stipe and the fronds are variable in colour, from deep-rose to reddish-purple and are rather leathery in texture. Dulse is a well-known snack food. In Iceland, where it is known as söl, it has been consumed throughout the centuries, and is an important dietary source of protein, fiber, potassium, iron and iodine. 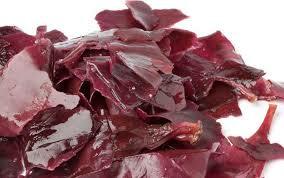 Dulse is also a good source of vitamins and trace minerals, containing all trace elements needed by humans. Dulse is used as fodder for animals in some countries. Fresh dulse can be eaten directly off the rocks before sun-drying. Sun-dried dulse is eaten as is or is ground to flakes or a powder. In Iceland the tradition is to eat it with butter. It can be pan fried quickly into chips, baked in the oven covered with cheese, with salsa, or simply microwaved briefly. It can be used in soups, chowders, sandwiches and salads, or added to bread/pizza dough. Finely diced, it can be used as a flavour enhancer in meat dishes, such as chili, in place of monosodium glutamate. Dulse is perfect in CHOWDERS, especially prized by vegetarians for its rich seafood flavor. It also goes well in any vegetable STIRFRY. Dulse is considered a superfood because of its high iodine and potassium content, plus a long list of micro-nutrients and phytochemicals and for it's proven antioxidative properties. Spirulina (Arthrospira platensis) is a simple, one-celled, blue-green algae, that belongs to the cyanobacteria family of bacteria. It gets it's name from the Latin word for "helix" or "spira", because of its spring-like physical characteristic. There are two species of spirulina . . . Arthrospira platensis and Arthrospira maxima, both of which are consumable by humans and other animals. Spirulina is cultivated worldwide; used as a dietary supplement as well as a whole food; and is available in tablet, flake and powder form. It is also used as a feed supplement in the aquaculture, aquarium and poultry industries. Spirulina occur naturally in tropical and subtropical lakes with high pH and high concentrations of carbonate and bicarbonate. Most cultivated spirulina is produced in open channel raceway ponds, with paddle-wheels used to agitate the water. The largest commercial producers of spirulina are located in the United States, Thailand, India, Taiwan, China, Bangladesh, Pakistan, Burma (a.k.a. Myanmar), Greece and Chile. Dried spirulina contains about 60% protein. It is a complete protein containing all essential amino acids, though with reduced amounts of methionine, cysteine and lysine when compared to the proteins of meat, eggs and milk. It is, however, superior to typical plant protein, such as that from legumes. Spirulina's lipid content is about 7% by weight, and is rich in gamma-linolenic acid (GLA), and also provides alpha-linolenic acid (ALA), linoleic acid (LA), stearidonic acid (SDA), eicosapentaenoic acid (EPA), docosahexaenoic acid (DHA) and arachidonic acid (AA). Spirulina contains vitamins B1 (thiamine), B2 (riboflavin), B3 (nicotinamide), B6 (pyridoxine), B9 (folic acid), vitamin C, vitamin A and vitamin E. It is also a source of potassium, calcium, chromium, copper, iron, magnesium, manganese, phosphorus, selenium, sodium and zinc. Spirulina contains many pigments which may be beneficial and bioavailable, including beta-carotene, zeaxanthin, chlorophyll-a, xanthophyll, echinenone, myxoxanthophyll, canthaxanthin, diatoxanthin, 3'-hydroxyechinenone, beta-cryptoxanthin and oscillaxanthin, plus the phycobiliproteins c-phycocyanin and allophycocyanin. Chlorella (Chlorella Vulgaris) is a high-protein freshwater micro-alga that was one of the first lifeforms on earth. It has the highest chlorophyll content amongst all plants known and is a genus of single-cell green algae, belonging to the phylum Chlorophyta. The name Chlorella is taken from the Greek word "chloros", meaning green, and the Latin diminutive suffix "ella", meaning small. Chlorella is spherical in shape, about 2 to 10 microns in diameter, and is without flagella. It contains both of the green photosynthetic pigments chlorophyll-a and chlorophyll--b in its chloroplast. Through photosynthesis, it multiplies rapidly, requiring only carbon dioxide, water, sunlight, and a small amount of minerals to reproduce. Chlorella is consisdered a superfood, because it is high in protein and other essential nutrients. When dried, it is about 45% protein, 20% fat, 20% carbohydrate, 5% fibre, and 10% minerals and vitamins. It is also abundant in calories and vitamins. Chlorella also supports healthy detoxification. Due to it's small size, unique molecular structure and being rich in chlorophyll, ingested chlorella bonds to metals, chemicals and some pesticides and in doing so helps support our body in eliminating these unwanted metals and toxins. Moroever, Chlorella is uniquely designed to NOT bind to the minerals our body needs to function optimally. 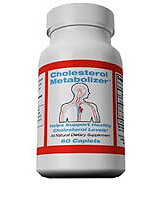 It does not bind to beneficial minerals like calcium, magnesium, or zinc. It's almost as if chlorella knows which metals belong in our body and which chemicals need to be removed. Chlorella is one of the most widely studied food supplements in the world. Aside from being the subject of medical research in the USA, USSR, Germany, Japan, France, England and Israel, chlorella has been extensively studied as a food source since it is made up of a whopping 50 percent protein and is considered a complete amino acid-based food. Even NASA has studied using chlorella as the one of first whole foods in space on the international space station! Under certain growing conditions, Chlorella yields oils that are high in polyunsaturated fats. Chlorella minutissima has yielded EPA at 39.9% of total lipids. Unlike many food supplements, chlorella has one unique feature that makes the manufacturing process one of the primary concerns when considering a source. Chlorella is completely indigestible by humans. We simply do not have the enzymes to break down its cell wall. Simply chewing and digesting chlorella, will not release the powerful health benefits it offers. This is because chlorella's tough outer cell wall, which is also chemically responsible for binding with the toxins inside our bodies, cannot be broken down by humans. It is therefore, imperative that the manufacturing process break down the tough outer cell wall for us (resulting in "Broken Cell Chlorella"), as this is the only way to make the chlorella biologically available to our bodies. Another concern when choosing which chlorella to use is the source water where it is grown and harvested. Since chlorella is a natural green food, it will be affected by polluted water and will retain environmental toxins if it's grown in contaminated waters. The chlorella contained in Sea Of Greens™uses a broken cell technology using a milling process that eliminates light and heat to preserve nutrients. Fucoidan is a marine algal polysaccharide found in the cell walls of many brown seaweeds (kelps). It is mainly found in various species of brown algae and brown seaweed such as mozuku, kombu, limu moui, bladderwrack, wakame, and hijiki. Variant forms of fucoidan have also been found in animal species, including the sea cucumber. 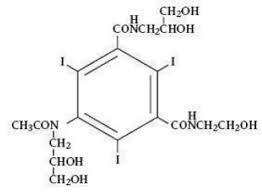 There are at least two distinct forms of fucoidan: F-fucoidan, which is 95% composed of sulfated esters of fucose, and U-fucoidan, which is approximately 20% glucuronic acid. In recent years, scientific interest has intensified around fucoidan. 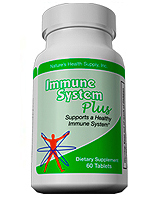 Some studies have suggested that fucoidan may help promote healthy immune function. particularly the radioprotective effects of fucoidan may have on bone marrow cells (BMCs), which are the main cellular reservoir for the hematopoietic and immune system. Many experts now believe fucoidan is one of the key nutrients responsible for the exceptionally long, healthy lives enjoyed in Okinawa, Japan, where fucoida is part of the daily diet and where there is the world's highest concentration of centenarians. Fucoxanthin is a type of carotenoid (xanthophyll) with the formula C42H58O6 and occurs naturally in edible brown seaweed and to a lesser degree in red and green seaweed as well. It is found as an accessory pigment in the chloroplasts, which accounts for their brown or olive-green color. Fucoxanthin is the subject of many clinical studies looking into potential effects on metabolism, energy expenditure, blood pressure, serum lipid levels and liver enzymes. 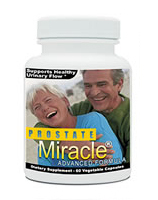 Other studies are studying potential anti-inflammatory, antinociceptive, and anti-cancer properties. The single most important element provided by seaweeds is iodine, which is more abundant in seaweeds, than in any land based plants or animals. All vertebrates require iodine, which the thyroid gland uses to produce the thyroid hormone, triiodothyronine (T3) and its pro-hormone, thyroxine (T4). The thyroid hormones are primarily responsible for regulation of metabolism. 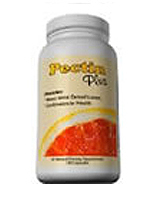 This function is vital for life, thus iodine is critical for maintaining good health. When vertebrates lived in the sea, even at about 60 ppb, there was a constant reliable source of iodine. Since some vertebrates left the sea, obtaining enough iodine has been a challenge to their descendants, including ourselves. Since no land plants require iodine, their taking it in from roots or leaves may be just incidental. That has meant that few land plants are reliable or even adequate iodine sources, unless consumed in large quantities. 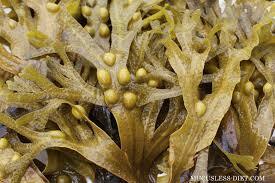 Eating 3-5 grams of most dried, unrinsed seaweeds will however provide the RDA of 100-150 micrograms. In adult humans, chronic low iodine consumption often results in first, goiter, an enlargement of the thyroid gland, deliberately generated by TSH (thyroid-stimulating Hormone) to increase thyroid gland cell surface area and more "iodine traps", and secondly, various manifestations of hypothyroidism. The treatment is often simply more dietary iodine for both conditions, which can be easily accomplished by consuming dietary seaweeds. Since the dawn of the nuclear age, iodine has taken on even more importance. When Uranium is used in nuclear fission, one of the decay products is Iodine 131. That means not only nuclear weapons and bombs, but also, all of the controlled nuclear events with nuclear reactor fuel rods, release radioactive Iodine 131 into the atmosphere. We are all continually and erratically dusted with Iodine 131 every day of every year. Additionally, nuclear disasters such as Three-mile Island in USA, Chernobyl in Ukraine and Fukushima in Japan all released enormous quantities of Iodine 131 into the atmosphere. Since then, millions of iodine 131-induced thyroid diseases have been reported worldwide, starting shortly after each event and continuing through today. Relatively rare 20 years ago, and unknown prior to 1945, thyroid cancer is now the number one cancer in children. The prevalence of thyroid cancers in both adult men and women is increasing at an alarming rate. Iodine 127 is the only natural isotope of iodine and it is very stable, unlike Iodine 131 which is very unstable and decays with the release of a high energy Beta particles, which wreak havoc on any tissue it comes in contact with. The reason Iodine 131 is so hazardous is because our bodies will happily take it in if we need iodine. Furthermore, Since prior to the human atomic age there was no iodine 131, we have not evolved to the point of developing any natural defense against it. If we have sufficient Iodine 127 in our bodies, our bodies will not take in the heavier iodine 131, but if we are deficient, our thyroids will take it up and will likely develop cancers. Potassium Iodide (KI) and Potassium Iodate (KIO3) are good sources for iodine 127, should a nuclear emergency arise. However, neither is recommended to take on a daily basis. Both can have side effects, could be overdosed on and could potentially be dangerous in general. It is far better to take an organic source of iodine. There is no better organic source than seaweed, which contains organically bound iodine. The organically bound iodine in seaweed is far more bioavailable than KI or KIO3, and it can be consumed everyday with no problem. if we continually take in 150 micrograms of iodine 127 daily (accomplished by consuming 3-5 grams of seaweeds daily), we will most likely be protected from iodine-deficiency. and thus protected from iodine 131.